We celebrated Harvest at St Peter's last Sunday and were truly blessed with such a beautiful day on which to hold our festival. We kicked off with a busy Pebbles service for our pre-school aged children which was followed by our Family Harvest Service. The children loved the link in the address from Susan Peatfield between 'The Very Hungry Caterpillar' book and the swarms of locusts from our reading from the Book of Joel. 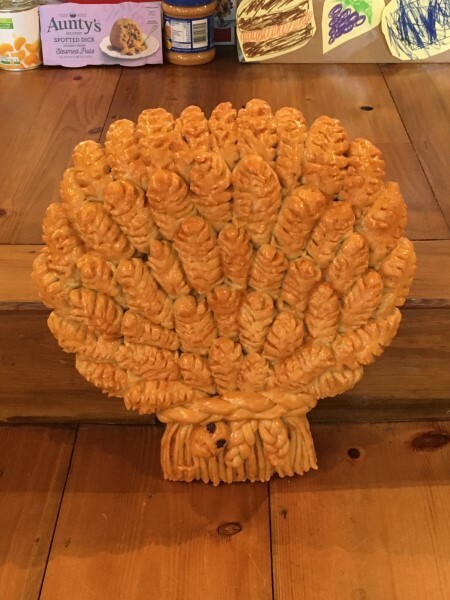 Another highlight of the day was seeing the amazing Harvest wheatsheaf loaf baked by the very talented Neil Gillespie. We rounded off the day with our annual Pet Blessing Service, at which there were a record number of dogs in attendance! As a result of all the donations that were made, we have a couple of trips to make to the Ealing Foodbank, which is great. Huge thanks to all those who donated food and who were involved with making the day a success, and especially to Fr Michael Selby for undertaking the organisation to make sure it all went so smoothly.